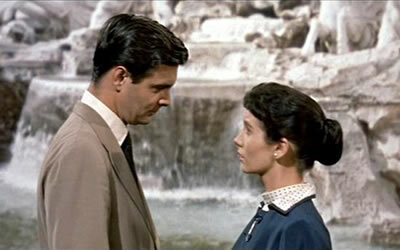 The cinematography is what’s good – no matter what else happens, the cinematography and the scenery are the star of the film, which is to be expected, given it was shot on location throughout Rome and its environs, and won an Oscar for cinematographer Milton Krasner. And being photographically excellent was actually a surprise, given the penchant the studios had for filming everything on the Hollywood backlot in the 50s, no matter the film’s setting. So, when the opening credits started rolling and we had the location shots of the fountain, I was sure we were in store for a West Side Story switch – location shoot for the credits, studio shooting and terrible backdrops and rear-projection for the rest. That the film was shot mostly on location thereafter was delightful. To be fair, while the scenery was the star, the rest of the movie does its part. The performances are uniformly charming, and the actors have genuine chemistry, which is harder to achieve than people think. The pacing and tone are light and fleet, even in the most serious of scenes – of which, there are few. Better, it actually sets a gentle romantic tone, free of all the overwrought, weepy nonsense you have to have these days, which makes the film a rather enjoyable ride. Despite being beautiful, and despite being charming and ingratiating, the film does have its queasy elements, rooted in a 1950s ideology, particularly with respect to gender/sexual politics. Specifically, while two of the three couples come together organically, the other pairing, of the young American and the Prince, is a bit more machined. At first meeting, both Prince and girl are taken with one another – they have rapport. But while the Prince seems genuinely attracted to the girl, she’s more smitten with his money and title. To make sure she catches his eye and gets her hands on the money and title, she sets out turning herself into somebody who likes all the same things he does, or pretends to. In other words, she subjugates her own personality and individuality to become a mirror image of him. Though she can’t quite pull it off, she does just enough to win the Prince over. Of course, being a romance, the couple must have something come between them – in this case, it’s the girl’s conscience. When she realizes she actually loves him, her guilt at deceiving him becomes too much to bear and she confesses. Obviously, he cuts her loose, only to later realize he loves her, too. Because everything the Prince knows about the girl is based on a lie, when she confesses the lie she should become a blank slate to him, i.e. she has nothing to love, because the personality he ever knew was based entirely on him. Ergo, unless his kink is women with no personality, there is no way he could love her – lust her, yes; love her, no. Even if he could love her, her deception is a bridge-too-far in the real world; it’s the type of thing a deranged stalker would do; and would eventually prove a cancer to a real-world relationship. Men only want women without a personality of their own, so if you want a man, don’t have one. The only woman worth having is a woman who gives up every shred of her individuality for you. That being said, a light re-write of the story would fix these issues without much effort, and since it was the 1950’s that produced this film, I’m inclined to give the film a little slack for having been made in a less-enlightened time. There is no denying Three Coins in the Fountain is a charming film that hits all the right beats – boy meets girl, boy and girl have fun, artificial barriers break them up, barriers are overcome and everybody is happy. Plus, the performances are good, the film is casual and non-demanding, and is simply happy to be happy – what’s not to like? But given all that, was it better than your 1954 Best Picture, On The Waterfront? In a word – No. No matter the twisted political views that film has, thanks to its director having been a HUAC informant and the film playing like a justification for ratting out people for their political thought, even while playing unfairly-loose with events to do it, it’s still the superior film of 1954. 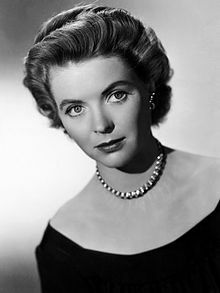 Dorothy McGuire was slagged off in one of my Best Picture Project entries, Gentelman’s Agreement, but even as she was terrible there, she’s quite good here as the woman almost-beyond-marrying-age finding love. Good as she is, though, she’s better elsewhere. For some, her best performance was as the mother in Disney’s classic weepy, Old Yeller. For me, her turn as the mother in the fantastic adventure film, Swiss Family Robinson, is tops. Anyhow, it’s appropriate that in this film she winds up with Clifton Webb, seeing how she played one of cinema’s great mothers, while Webb played one of cinemas best fathers in Cheaper by The Dozen. Yes, despite being called Three Coins in the Fountain, there are only two coins actually thrown in the fountain. The three women are Americans at work in Rome, so they might have good reason to return. I assume the reason the third woman gets her wish, despite not throwing a coin of her own in the fountain, is because of some unwritten “Buy Two, Get One Free” thing. It was simply easier and cheaper to control filming in a studio, using sets or matte shots, no matter how lousy it looked on film. See e.g. much of The Greatest Show on Earth. If West Side Story is the worst example I can think of off the top of my head, then the best example would be Black Narcissus, which did practically no location photography at all, was shot almost entirely on a stage with the use of backdrops, and matte paintings, all of which are only noticeable if you know to look for them. That would be the office-boy/office-girl and the secretary/writer, who’ve each known one another for some time before the film begins, have become genuinely acquainted, and therefore have some basis to build a relationship on.